October is National Breast Cancer Awareness Month. 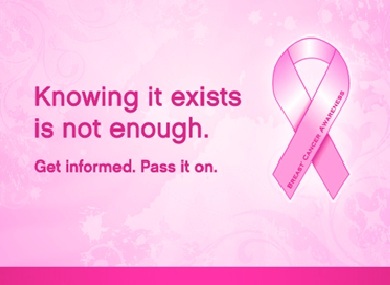 With over 250,000 cases diagnosed in 2010, breast cancer is one of the most common cancers in the United States. However, it is also the recipient of unprecedented visibility, awareness, and research. Since its inception in 1982, the Susan G. Komen for the Cure organization has invested over $1.9 billion toward breast cancer research, largely thanks to community events held nationwide. Aside from fundraising involvement, you can do your part by keeping yourself personally educated about breast cancer- for the sake of both yourself and your loved ones. Awareness: The earlier breast cancer is found, the easier it is to treat. Give yourself a monthly breast exam. For guidance, see Breastcancer.org’s easy-to-use tutorial: The Five Steps of a Breast Self-Exam. Health: “Stay Healthy” is one of the American Cancer Society’s primary areas of focus. Take care of your body with good nutrition. Keeping healthy foods around the house is a great way to make sure that smart choices are easy choices. Canned vegetables, whole grains, beans, rice, canned seafood, and olive oil (the last two of which contain healthy omega-3s) are all on ACS’s “In the cupboard” list. Exercise! A healthy lifestyle includes regular exercise. A fit body is strong, balanced, resilient, and better equipped to handle any challenges that come your way. For more information on a healthy lifestyle, see the ACS Guidelines on Nutrition & Physical Activity for Cancer Prevention.